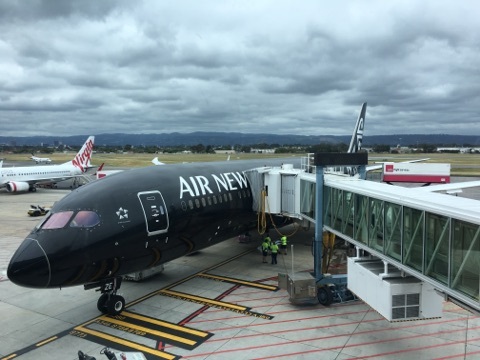 Air New Zealand Business Class Review – flying from Adelaide to Auckland on the Dreamliner (787-9). Air New Zealand flies to Adelaide multiple times per week with a shiny new 787-9 Dreamliner, offering an exciting new way for Adelaide-based travellers to travel across the pond. 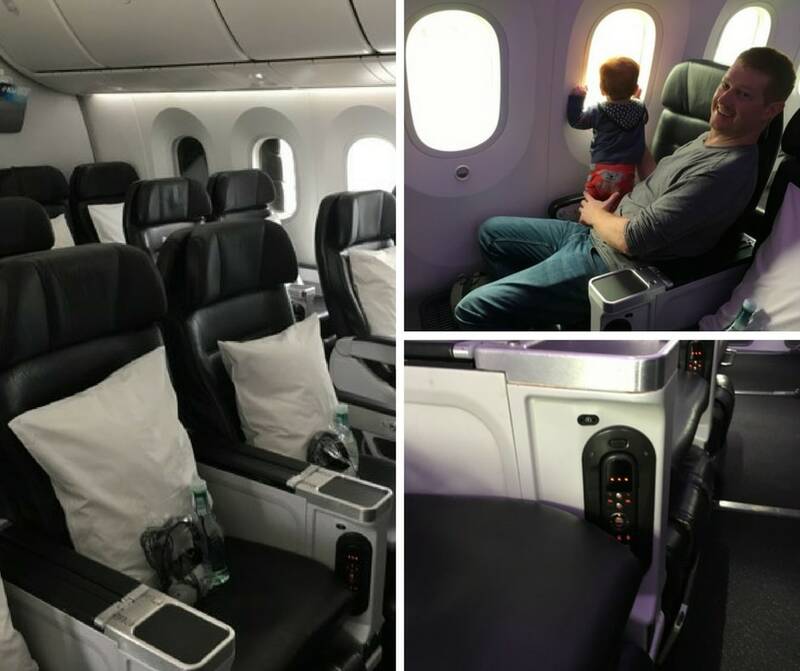 I was very keen to review the new Air New Zealand business class new service, and was fortunate to nab a seat on the inaugural flight. I booked two Air New Zealand business class seats using Singapore Airlines Krisflyer points, earned through the American Express Explorer Card. Air New Zealand business class is a wonderful use of Krisflyer points, and one of the best ways to cross the Tasman. The Singapore Airlines website doesn’t support searches for partner award bookings; you’ll need to search via another Star Alliance partner that does. I was able to search for the flights via United Airlines and then called up Singapore Airlines to easily book my Air New Zealand business class seats over the phone. With check-in completed promptly, and we were soon on our way to the lounge. Air New Zealand business class passengers use the Qantas Domestic Lounge, located before international security. The Lounge is large and airy. It’s not particularly exciting, but it’s a perfectly adequate space to relax for a short time before flying. We arrived shortly before 10 am and enjoyed a morning coffee. Given that Star Alliance partner Singapore Airlines operates a lounge in Adelaide Airport, it’s somewhat surprising that Air New Zealand business class passengers are directed to a Qantas Lounge – though admittedly, the Singapore Airlines Lounge is very small. Shortly before 11 am, we headed through to clear international security. We appeared to be the last passengers through, and the clearance process only took five minutes. Inside the gate, we spotted a large media contingent celebrating the inaugural flight. Outside sat an Air New Zealand Dreamliner in it’s distinctive black and white livery. Upon boarding, we were promptly greeted and shown to our seats. The soft purple lighting caught my eye. 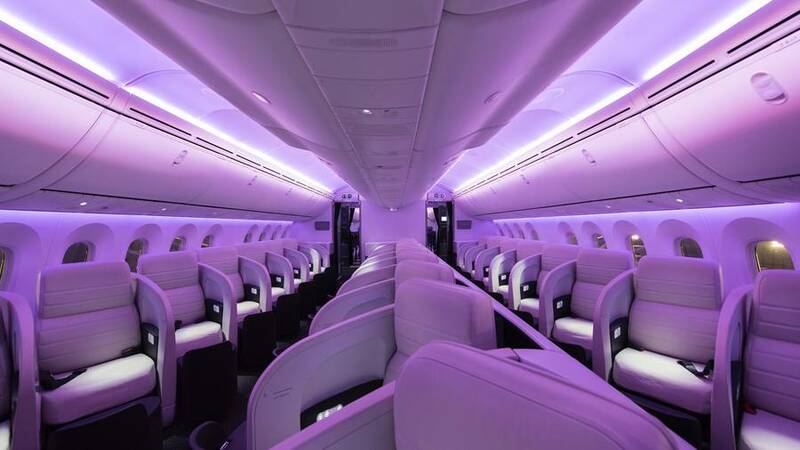 It provided a calm ambience and enhanced the gorgeous interior of the Dreamliner. Miss Champagne Mile and I settled ourselves into seats 4J and 5J. We waved good bye to Mr Champagne Mile and Baby Champagne Mile. They were seated just behind us in the Air New Zealand Premium Economy cabin (luckily nabbing one of the bassinets). 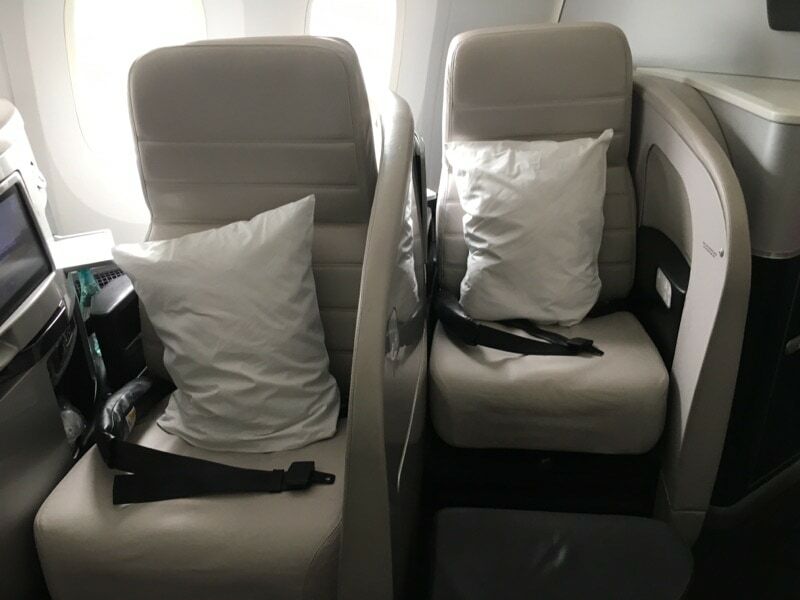 The Air New Zealand Business Class cabin features a 1-1-1 seat configuration in herringbone formation, which isn’t something we usually see in business class. While this format provides every traveller with direct aisle access, all seats diagonally face inwards towards the front of the plane. You’ll find row ‘A’ to the left with its own private aisle, with ‘J’ and ‘K’ sharing a walkway. Seats in row ‘A’ would definitely be my pick for solo travellers. These seats feature more privacy and a greater amount of overhead storage. 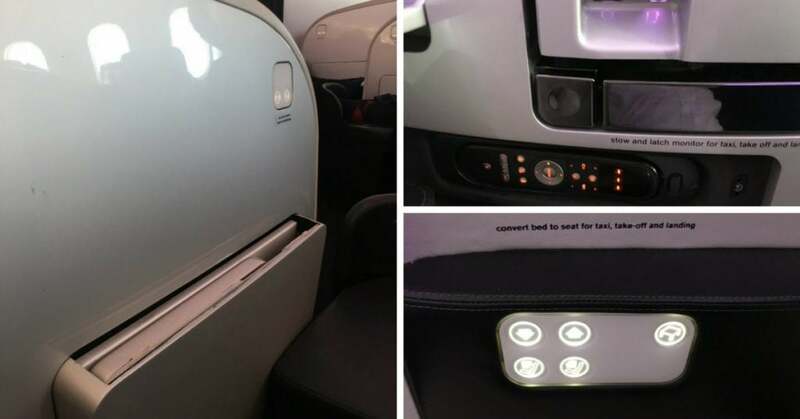 With a seat width of 22 inches (56 centimetres), the Air New Zealand business class Dreamliner seat is arguably on the narrow side for those with broad shoulders. The upholstery is soft, sand coloured leather and features high, non retractable privacy barriers on each side. The seat flips to create a bed with a foam mattress, allowing passengers to recline for taxi, takeoff and landing. An ottoman at the foot of the seat provides clever storage space and acts as a handy perch for a dining companion. The Air New Zealand business class in-seat dining table is very versatile – it can be lifted up to allow aisle access while in use, meaning you can exit your seat during meal service. Travellers will find an 11 inch LCD screen and entertainment controls built into the left hand privacy divider. Alternately, seat controls are found on the right hand side. Once we’d settled in, I happily accepted a glass of champagne and the menu. Air New Zealand Business Class currently serves Billecart-Salmon NV, my favourite non-vintage champagne. The Air New Zealand crew were very proactive with pre-departure refreshments, and treated me to a second glass before take off. The service compared very favourably with long-haul Cathay Pacific business class, and other trans-Tasman business class services, where in my experience, you’ll generally only be offered water or juice. 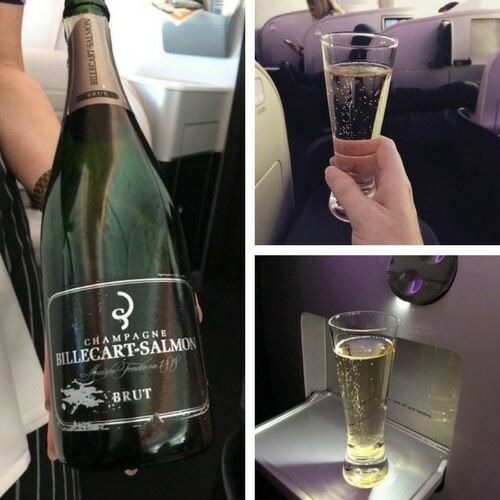 Travellers in Air New Zealand business class are treated to Billecart Salmon NV – and they’ll happily top you up before departure! My first experience flying on an Air New Zealand Dreamliner certainly didn’t disappoint. Upon takeoff, you’re struck by the quiet hum of the engines and the airy windows which lulled me into a sense of relaxation – even with a three year old seated next to me. As soon as the seat belt sign switched off, the crew came around to take drinks and meal orders. Unfortunately the published menu had changed (a catering issue had been encountered in Adelaide), but the competent crew reeled off a number of other tempting options and I selected my starter, main and dessert. I stuck with Billecart-Salmon Champagne throughout the meal. Air New Zealand takes its Business Class wine selection very seriously. No less than two sparkling wines, three whites and three reds were on offer during the flight, and several crew members were identified as ‘wine specialists’, having completed intensive training in food and wine matching. Before long, we were offered crusty bread rolls and a serve of warm garlic bread. It proved to be a great hit with Miss Champagne Mile. 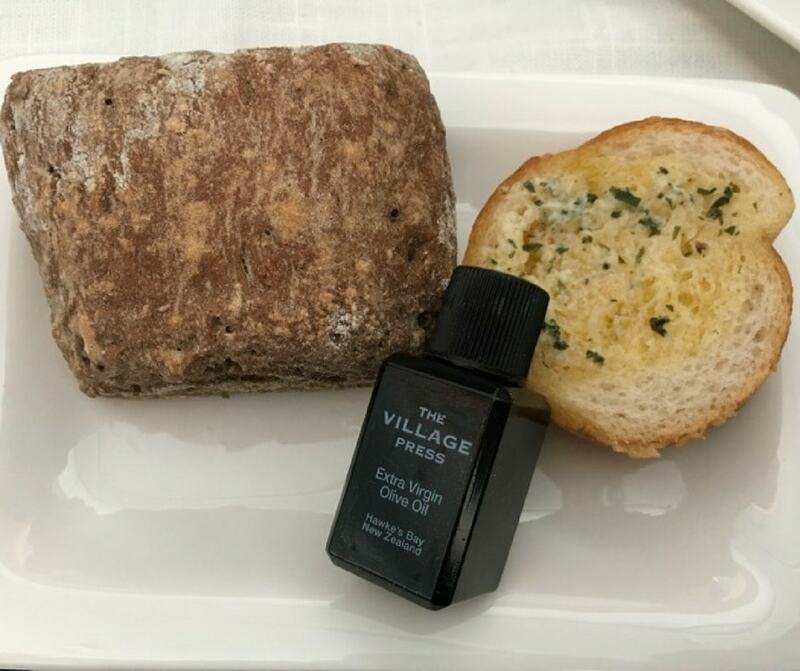 A small bottle of ‘The Village Press’ olive oil from Hawke’s Bay accompanied the tasty and fresh bread. Shortly thereafter, my starter arrived. I’d selected the heirloom tomato and burrata salad, with rocket and mustard dressing. 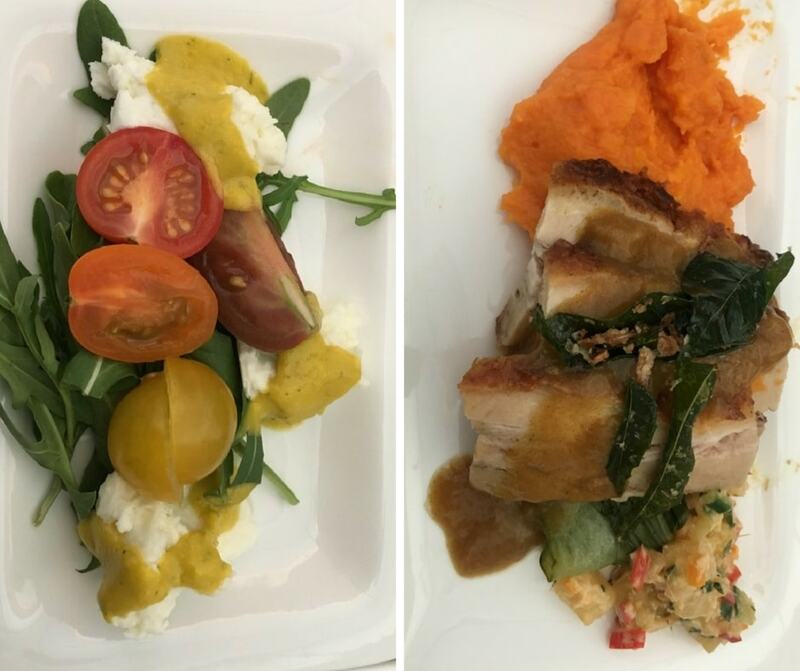 It was a great example of Air New Zealand business class cuisine – beautifully fresh, with the tomatoes were of excellent quality. For main course, I chose the pork belly with pumpkin mash. Pleasant. Miss Champagne Mile skipped the starter and opted for a plain chicken breast for her main course. 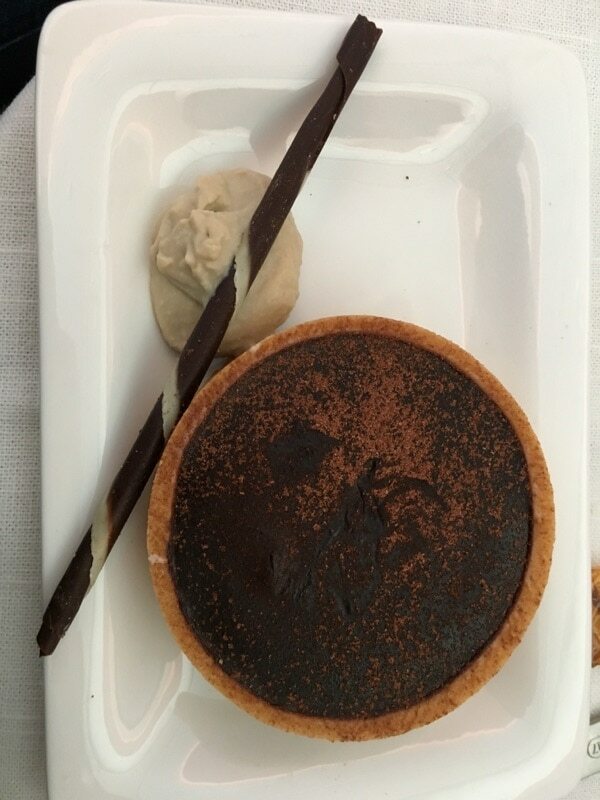 For dessert, I opted for the chocolate tart with coffee cream, while Miss Champagne Mile enjoyed a scoop of chocolate ice-cream. Following the meal service, we had around 1 hour 45 minutes till arrival in Auckland – just enough time for a movie. Miss Champagne Mile watched Frozen, and I ambled back to the Air New Zealand premium economy cabin. Baby Champagne Mile was enjoying the view from out of the window. The Air New Zealand premium economy cabin is sometimes described as ‘business-lite’. The seats are smartly finished in black leather and are arranged in a 2-3-2 configuration. Each seat provides a pitch of 41 inches and a width of 19.3 inches. During our flight, premium economy passengers enjoyed the ‘Business Premier’ menu. However, I’m unsure if this is normal, or due to the catering mishap mentioned above. The remaining hour and a half of our flight passed quickly, and soon it was time to land. Impressively, the Purser walked the entire business cabin to personally farewell each guest. 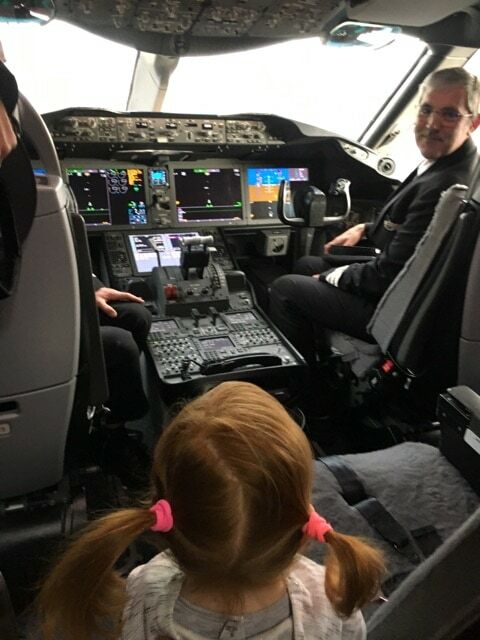 We were invited up to take a quick peek at the Dreamliner cockpit with the children upon landing, and Miss Champagne Mile enjoyed a chat with the pilots. All in all, I really enjoyed my journey in Air New Zealand business class across the Tasman. Travel with children can be incredibly rewarding (and it helped that the kids were generally well-settled during the flight). 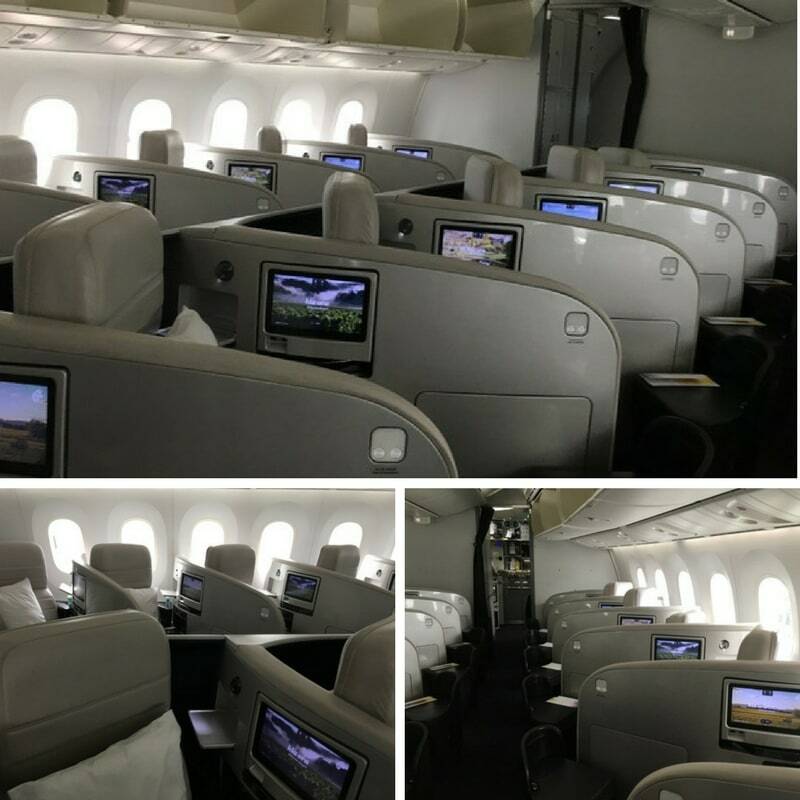 Along with the friendly in-flight service, the general ambience of the Air New Zealand Dreamliner made for a very relaxing flight and I felt very refreshed on arrival. At 25,000 Singapore Airlines Krisflyer points, my one way Business Premier ticket represented great value. If you’re a collector of Air New Zealand Airpoints, you could also put these towards this flight. Air New Zealand is now operating daily return services from Adelaide to Auckland on the Dreamliner. Full timetable details can be found here.